"The audience was there to listen to whatever Peyroux wanted to give them, something real—not something happy." When I listen to jazz singer Madeleine Peyroux’s haunting cover of Elliott Smith’s “Between the Bars,” I imagine a couple clutching each other, slowly dancing cheek to cheek. How better to deal with the painful lyrics? Perhaps by the end of the song there’s a small, salty stain dotting the shoulder of a blouse. 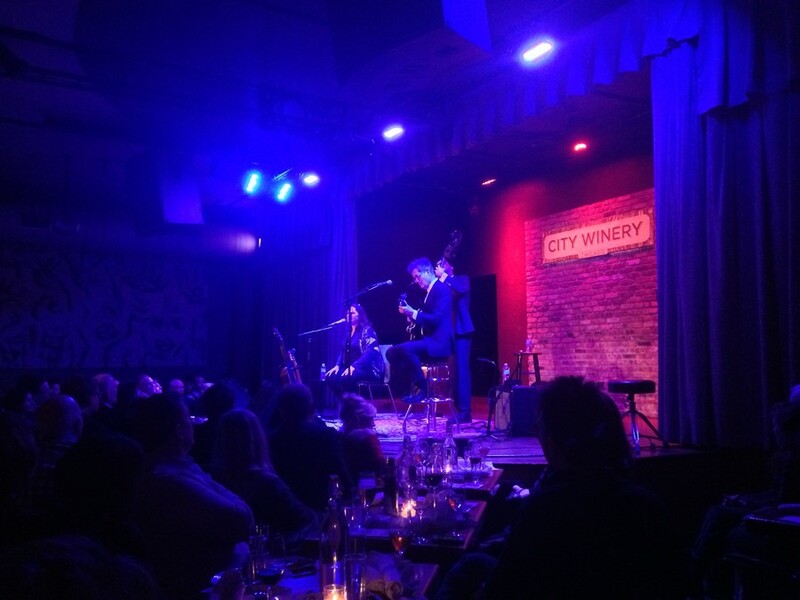 This image materialized on Monday night, as Peyroux performed the song during an encore on the last of her three sold-out shows at City Winery in the West Loop. A couple in their 60s, trying to beat the crowd to the valet, stopped short of the door when they heard, “Drink up baby; stay up all night” in Peyroux’s drizzly, buttery-rich voice. Along with others, I shouted a request for “Between the Bars.” She was hesitant: “You really want to end on something sad like that?…. Well, we are in a bar after all.” Indeed, most audience members were not without a glass of wine or beer. Peyroux joked onstage that she knows just three types of songs: “love, blues, and drinking—and my favorite is when that’s just one song. Thanks to Randy Newman for that.” She performed Newman’s “Guilty,” which is included on Keep Me in Your Heart for a While, taken from 2013’s The Blue Room. With musical accompaniment—and occasional harmonizing—from bassist Barak Mori and guitarist Jon Herington, Peyroux performed a smattering of favorites from the new album, as well as unrecorded songs including her new, self-penned “Garbage Man.” She describes this last song as her “idea of a love song for the 21st century” and a jazzier version of the great Jamaican-born dub poet Linton Kwesi Johnson’s “More Time,” a reggae-tinged tune whose lyrics envision a life with more time for quiet pleasures. But the audience was there to listen to whatever Peyroux wanted to give them, something real—not something happy. Peyroux doesn’t keep her pain a secret. While she says she’s happy today, she has experienced profound sadness in her life: She grew up with an alcoholic father and at one point ran away from home. She’s currently writing a memoir about her experiences living on the streets of Paris, before her career as a musician bloomed. As she said, she’s attracted to blues, to songs about drinking. Leo Sidran, musician and host of the podcast The Third Story, recently said to Peyroux in an interview, “You have your influences, you try to sound like them, and you never will be them. In failing to sound like someone else—that is where you will become yourself. You’re kind of fucked if you really succeed, because then you don’t know who you are.” And he’s right. The audience was there to hear Peyroux’s take on the lyrics of Leonard Cohen’s sad love songs, embed them with her own experiences, and enhance them with her rich voice that—even at a near-whisper—is layered with nuance and range, and could never sound like the original performer. After all, I wouldn’t have been there if I didn’t want to feel the intense need to grab somebody, hold them close, and dance.